As for now Hundreds of men crowd shops in central Baghdad, perusing military equipment including helmets, boots and camouflage uniforms that they will need after volunteering to fight against a major militant offensive. 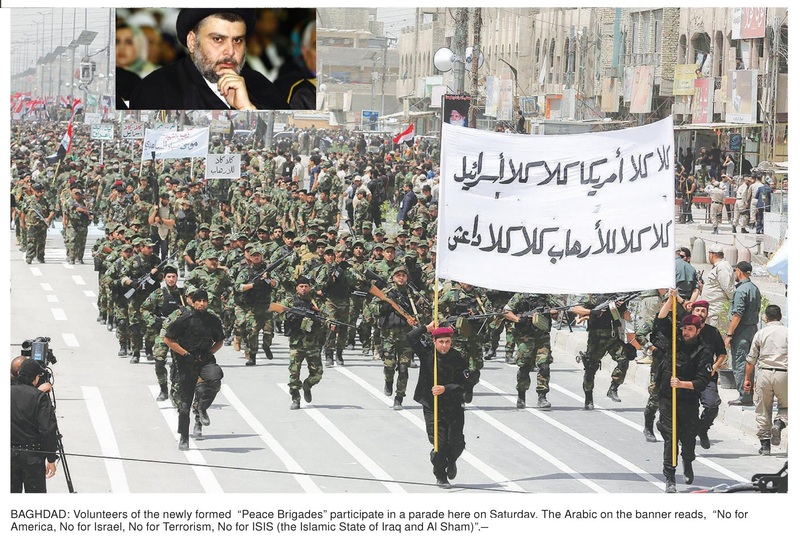 Urged on by a call from top Shiite cleric Grand Ayatollah Ali al-Sistani, thousands of Iraqis have volunteered to fight against Saudi Sponsored Wahabi Terrorist who have overrun swathes of northern and central Iraq. “From the beginning of the crisis, there was an increase in sales… of about 200 percent, 300 percent,” while prices have risen as well, says Osama, the owner of one shop in central Baghdad. Previously, “all sales were to the army and the police,” but that changed with Sistani’s call and the worsening situation in the country, Osama says. “We do not have military experience, but God willing, we will gain military experience from people older than us,” says Walid Najm, a young man wearing sunglasses and a hat with a digital camouflage pattern who decided to volunteer to fight the militants. “I am a barber, but I left this career because the country needs me,” he says, later trying on a camouflage-covered helmet and protective goggles. Unlike Najm, Zora has five years of military experience from Saddam Hussein’s forces, and is now ready to use his skills against militants who include supporters of the ousted dictator. Abbas Sadiq, who is accompanying Zora, says he wants to “defend the innocent people,” whether they are Sunni, Shiite or Christian. Most shops offer similar selections of items, but one sells patches for Saraya al-Salam, Asaib Ahl al-Haq and Ketaeb Hezbollah, the latter two of which are Shiite militant groups that split from Sadr’s Mahdi Army in past years. “Most of the buyers are volunteers,” he says. As for Now US wants to take settle some other Scores also , due to which they have to leave Iraq, Because of a Powerful Shia Force , as they have to surrender their demand of staying in Iraq and finally , Iraq was freed from the US forces Presence , but their remnants in shape of Al Qaeda terrorists and other Saudi Wahabi Terrorist Networks , who were Once Trained and funded by them , and now again due to their Heavy funding these elements have once again been Revitalized , and Plus the Defeat of the Saudi and US in Syria , now the Desperate Saudi and US sponsored Terrorist Network , are trying their Level best to create Uncertainty and Chaos in the country . As now when Democracy have been restored in the country , after 9 years of War and Uncertainty , and as now the Down Trodden & the Much Oppressed Shia Population , have come in the fore Front , as due to the Majority in Iraq , as it consist of more than 75% of the Population , So now the Minority Sunni and the Kurds are being conspired by the West and Persian Gulf States to claim the same amount of share as they were getting , in the Saddam Era , when the Shia Majority Population of Iraq was suppressed and were getting No Rights in the Government or any walk of Life. And the same forces of the Saddam Era , combined with the Saudi and Western Funded are trying to Inflame Sectarianism by Propagating , that the Minority Sunnis and Kurds should get the Equal Power, which is against the Democratic Rules , as the Majority always gets the Bigger share in Power and Government Structure. And the Biased Saudi and the Western Media , was tight Lipped ,when the Wahabi terrorist were , brutalizing and creating Havoc in the country, and till they advanced and even captured some Cities , But the Moment , when the situation was extremely deterioting , as they even tried to the Bomb the Most Holy Shrine of the Shiite Imams. And when as a defensive strategy the Great Ayatullah Sistani , called for All the Iraqi to take Up Arms against the advancing terrorist and to teach them a Lesson, on which Millions of Iraqi Men answered his call and Volunteered themselves to Guard their Land and the Holy Sites . And Of course the Majority of them was Shia Men , as the Majority population is Shia . After seeing a Massive Response and seeing a Huge Army Ready in a No. of Day against the Wahabi Terrorists , their sponsors and supporters , the Western Nations started to call it Sectarianism . But Now as the Volunteers and the Army has taken up their Places , and in a couple of Days the Scenario will be changed , and the Western Plan to Divide the Middle East into a No. of smaller countries , which is more manageable for them to control and dictate their terms will no longer be implemented , by the Grace of God. This entry was posted in Iraq News, Jafria and tagged central iraq, Grand Ayatollah Ali al-Sistani, Iraq, military experience, Muatada Al Sadr, Saddam Hussein, Saudi Sponsored Wahabi Terrorist, Shia Malitia, Volunteers. Bookmark the permalink.